Cabeau, a world leader in consumer travel products available in more than 110 countries, is excited to announce its partnership with Scorpio Worldwide, a leading distributor of high quality goods to the global in-flight and travel retail market. Beginning February 1, 2017, Scorpio Worldwide will be offering Cabeau to its vast in-flight network. The partnership will initially focus on the global distribution of Cabeau’s Air Evolution pillow. 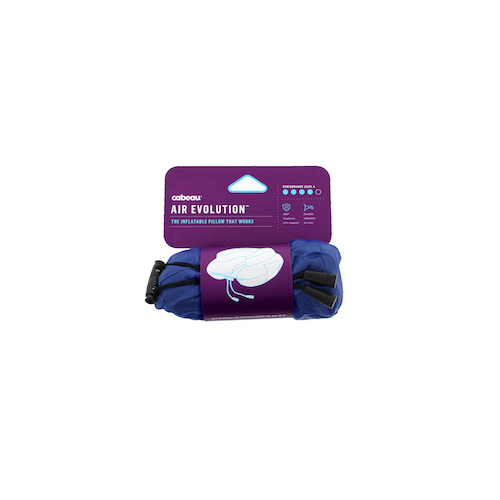 Using space-saving technology, the Air Evolution features an adjustable air core so consumers can inflate to their perfect level of firmness. Covered in super soft velour, the practical pillow offers a compact solution to finding comfort while travelling and allows consumers to pack light and sleep tight. Offering long-lasting head support, the pillow can compress to fit inside a can-sized travel case for quick and convenient packing. “As we continue to grow the global footprint of our brand, we are thrilled to make our products even more accessible with our new in-flight option,” says David Sternlight, Founder and CEO of Cabeau. ”We are carefully building a loyal team of strategic partners who share in our vision to elevate the travel experience and found that with Scorpio.” Ian Cowie, Managing Director, Scorpio Worldwide, comments, “Cabeau’s pillows are completely unique from anything we have seen before, both in their quality of build, and design making them practical for the in-flight channel. We enjoy working with brands that are dedicated to the travel retail industry, and it is clear from our early dealings with Cabeau that they most definitely are, therefore we are delighted to be working with them and assisting in helping Cabeau grow its in-flight business.” Following the initial launch with the Air Evolution pillow, Cabeau plans to add additional products to its in-flight roster of offerings.